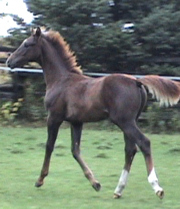 A beautiful blond colt, well put together, with good angles, and well set head and neck. Shedding out to be liver chestnut, like his sire Belissimo, and granddam, SPS Ester. As his name suggests, in Boundless I see signs of a strong, athletic dressage prospect with power, grace, and presence. Boundless was SOLD, as a 2 year old, to a dressage rider in New Brunswick. Rose has started him herself and she and Boundless are enjoying the ride! Pictures show Boundless as a foal, and as a 3 year old, being started by his perfect-partner, Rose.